My mood board to give a feel for the style I wanted to keep in mind while working. Although the 'Chai Botanical' scarf ended up becoming a celebration of chai tea, it started out as a celebration of Indian miniature painting. Specifically, I love the way that trees are rendered in these meticulous, pattern-filled works—the abstraction is genius. My original idea was to fill an entire scarf with just trees painted in this style. 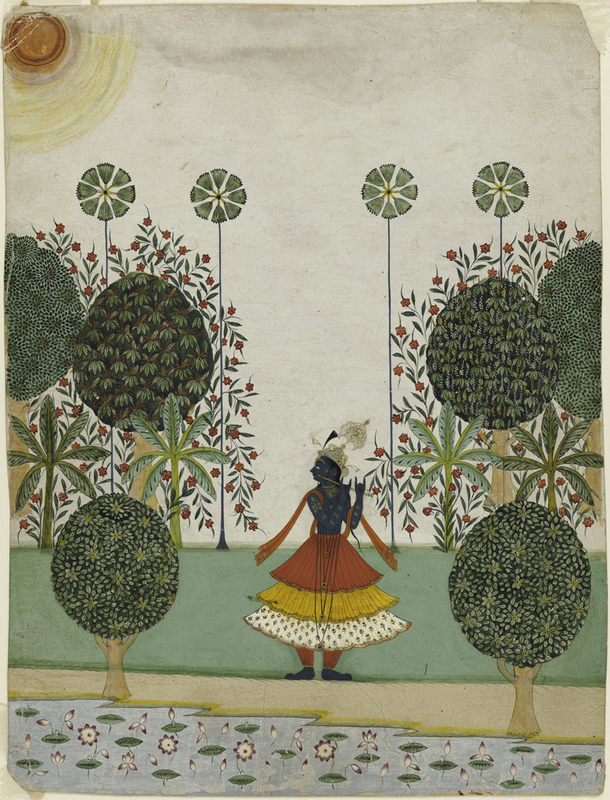 Krishna Fluting in the Forest, Rajasthan, circa 1720-40. Image from The Harvard Gazette. A cropped section of my original paintings that were then scanned in and arranged to create the design for The 'Chai Botanical' Scarf. However, I also fell in love with the exquisite botanical art of the Mughal period. I decided a botanical composition would be the centerpiece while the trees would make up a significant border—which is arguably the more important design area on a scarf, as it is what's seen most when the scarf is being worn. Left: A Balsam Plant, Deccan Region, circa 1660-80. Now at the Philadelphia Museum of Art. Right: A work by Kailash Raj, a modern miniaturist who paints in the tradition that has been handed down through his family. 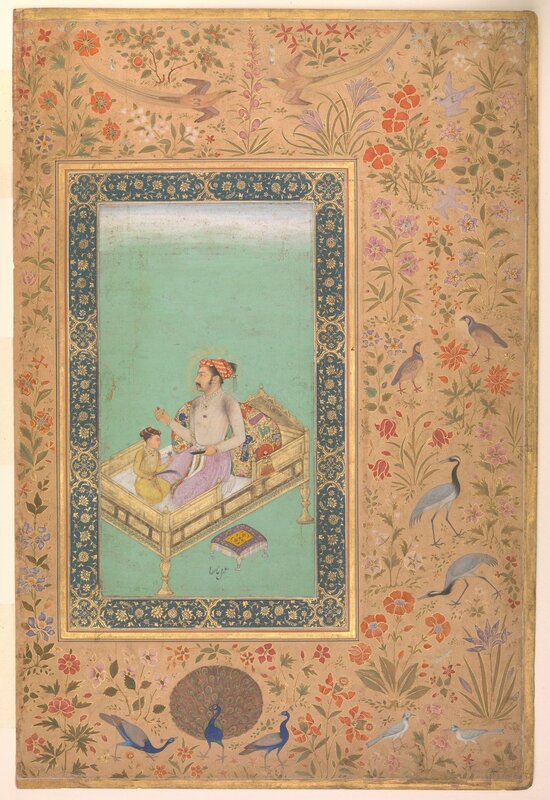 The Emperor Shah Jahan with His Son Dara Shikoh, folio from the Shah Jahan Album, circa 1620. Now a part in the collection of The Metropolitan Museum of Art. The birds swooping across the corners were from this beautiful reference, one of the innumerable details that caught my eye during research. The specific section from the above folio that inspired the birds in the corners of The 'Chai Botanical' Scarf, the original painting for which is shown on the right. Left: Page with a Safavid drawing from an album made for Emperor Shah Jahan, Persia and India, circa 1625-50, image courtesy of Sotheby's. The structural portion of the border takes cues from classical Indian architecture and decorative embellishment, but also from more modern interpretations. Marie-Ann Oudejan's fanciful interiors blew up on the design scene and kept drawing my attention. A section of Bar Palladio Jaipur, a restaurant and lounge located within Narain Niwas Palace Hotel. Designed by Marie-Ann Oudejans. 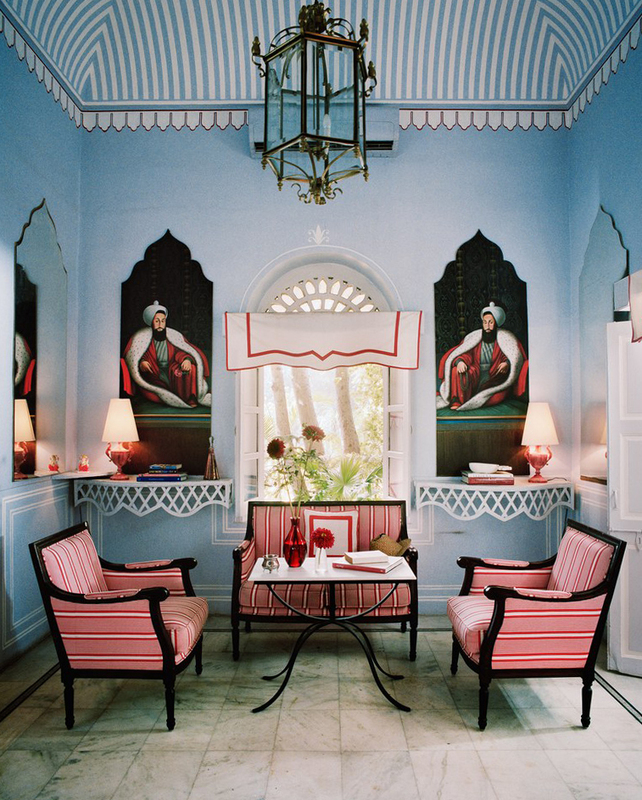 A room in Marie-Ann Oudejan's private Jaipur apartment. 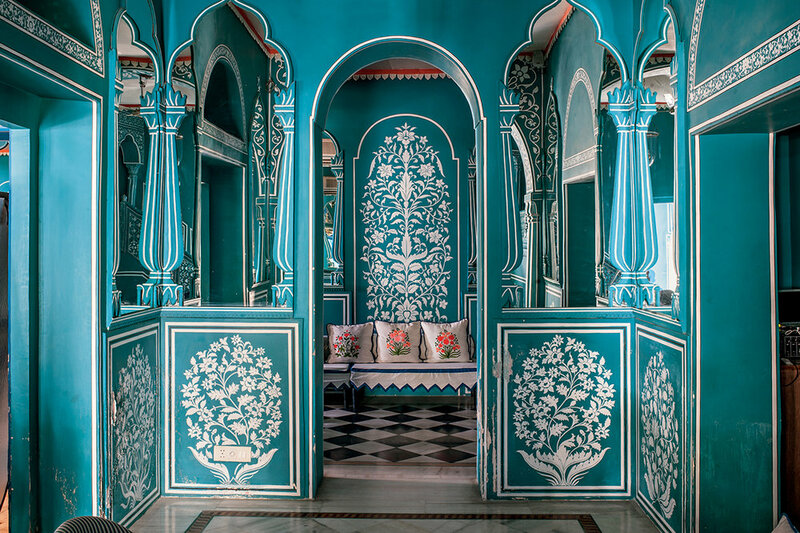 Image courtesy of Architectural Digest. 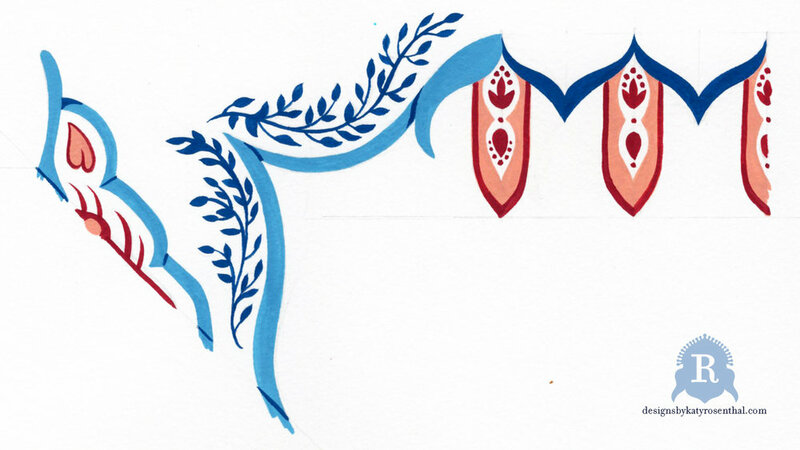 My gouache painting for an original border design inspired by the above research. The image on the left is from thekitchn.com. The botanical illustration on the right is of the Common Pear, or Pyrus Communis, from Flora of Germany, circa 1903. Finally, it came down to the subject matter of the botanical centerpiece and how to render it. I could picture in my mind many times I'd seen beautiful photographs of what goes into making chai tea from scratch. Not only do I love chai, but it also fit in well with paying homage to Indian miniature painting. My own botanical illustration of the basic ingredients of chai: ginger, cloves, tea plant, cardamom, peppercorn, and cinnamon. This served as the basis for the more stylized version that became the central motif of The 'Chai Botanical' Scarf. I painted this for a botanical illustration contest, knowing that I could use it as a study for my scarf design. 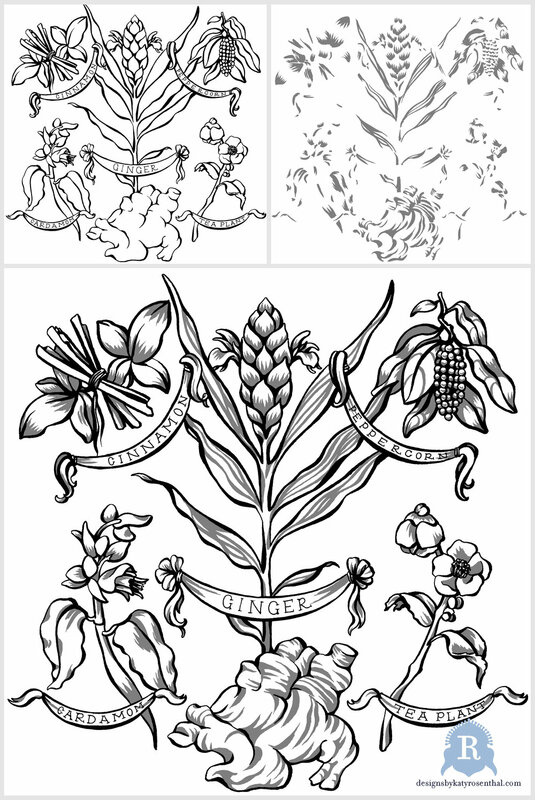 I submitted it with this statement: "This botanical illustration celebrates the ingredients used in concocting chai tea: ginger, cloves, cinnamon, cardamom, peppercorn, and tea leaves—in their plant forms that would be found in nature. I was inspired to create this piece not only because of the beauty of these plants, but also because I find it important to contemplate the sources of what we consume. Cinnamon, for instance, is part of my every day life, but when I set out to illustrate it I realized I had no idea how it was harvested (it is the inner bark of the cinnamon tree). Taking the time to understand our resources helps us to appreciate the vast, interlocking chain of nature, human labor, and machinery that allows us to the live the lives we lead, and hopefully to become more conscious consumers." The style of this illustration, however, did not suit the border that I had already created. I wanted something much more simple, with abstraction and an emphasis on line work. The central ginger plant reminded me of compositions from the Mughal paintings I had been looking at and I went with that feeling of composed, almost rigid representations of the plant life. The idea of adding the banners fell out of theme a bit, drawing much more from a European look, but the consistent line-weight and style allowed it to blend in and capture a little whimsy. Based on my own more realistic gouache botanical illustration, I created this stylized ink version of ingredients used to make chai, which is the central motif of The 'Chai Botanical' Scarf's design. As shown above, this central illustration was created all in ink, with two separate layers: one for the outlines and another for the shading. All of the color was added in Photoshop. When I put the whole composition together, there was a lot of negative space that needed a special extra touch. In order to add some dimension and texture, I developed a repeating pattern using the leaf designs from one of my hand painted trees. 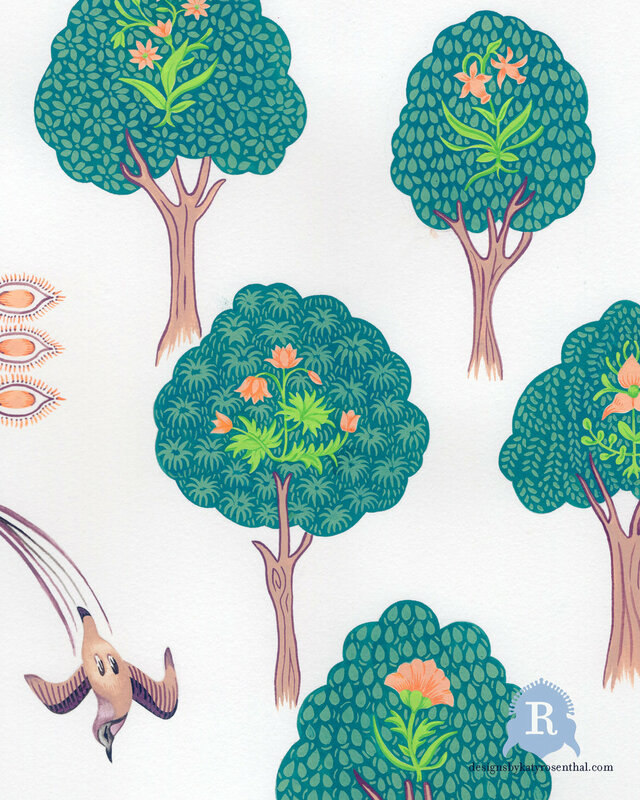 The pattern I developed to fill negative space in the 'Chai Botanical' design. And it all came together! It was very rewarding to tackle this subject matter for a project this important, as miniature paintings and Indian textile designs in general have been at the top of my inspirations list for the past few years. I hope you can see why! The 'Chai Botanical' design in its final scarf form! Printed with GOTS-certified organic inks on organic ahimsa silk.